How about a green fig salad? Ah! 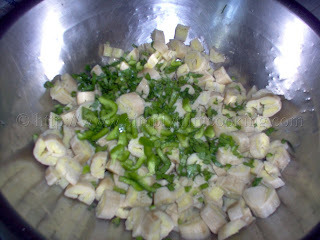 green fig, truly a Caribbean staple. 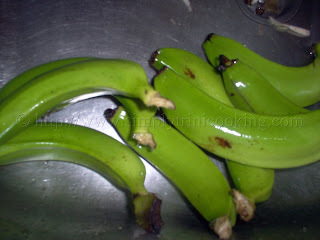 We just can’t do without green bananas in our cooking. 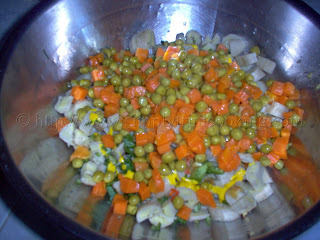 We use it in soups with other provision, in drinks, in pies and now today we have it in a salad. 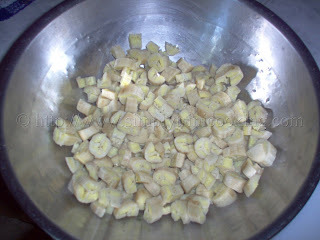 I have to mention again that when we refer to fig in the Caribbean we are really talking about bananas and not the other type of fig that is commonly known. Green figs are totally nutritious containing vitamins such as vitamin C, B6 and Potassium. 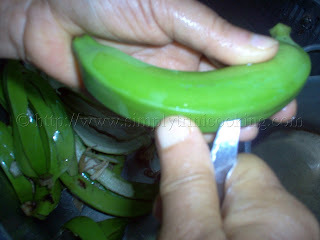 In Trinidad and Tobago we grow many types like Gros Michel, Lacatan, Silk fig, Short fig or cooking fig (the tree is short hence the name) , Mataboro, Giant Governor, Moko (two types red and green but not to be confused with Moko Plantain), Chiquito or Sikiyea (a small type), and I.C.2 or Mysore which is a little sour to the taste. 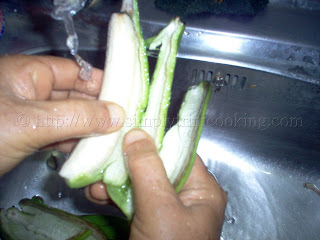 ; it looks similar to the Silk fig. In my yard alone I have probably about 20 trees growing of all types, so I’m never without this wonder of a fruit and I always have lots of fig leaf for my pastelles also. 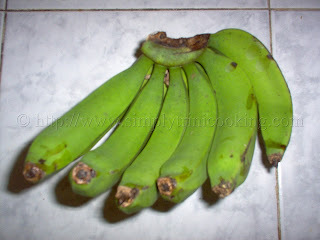 When it’s green it is starchy, that is why we class it with provision like dasheen, yam, cassava etc. and usually eat them together. 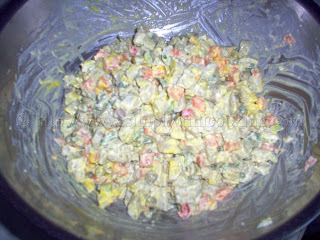 Green fig salad is a variation on the potato salad I posted some time ago. The fig is substituted for the potato but the rest of the recipe is basically the same. Seeing that this substitution with the fig was so successful, and tasty I might add, probably the other provision could be used…. Hmmm! that has me thinking… a nice yam or eddoes salad sounds like a plan. Anyhow, I will have to experiment on that one first before I post it. 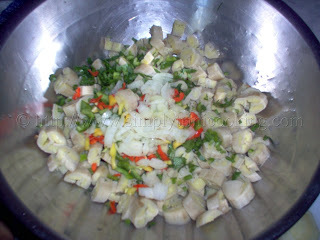 Here is Green Fig or Green Banana Salad. Wash and peel the figs. 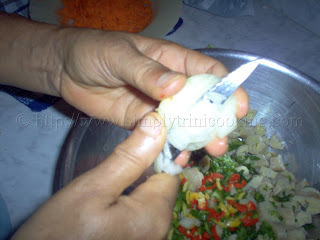 Note the technique for peeling. 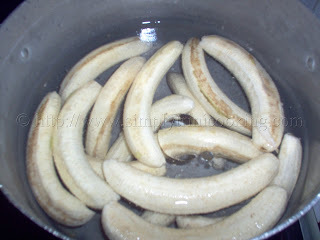 Boil for approximately 10 minutes and drain. 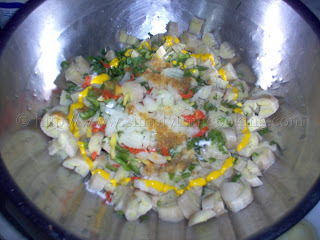 Add salt, mustard and pepper to taste. This salad is served as a side dish when we’re having lunch, so for your Christmas lunch you could try making this recipe instead of the usual potato salad. What do you think? Anyhow, while you’re thinking about that… See you soon. I gone! Thanks so much for this recipe. 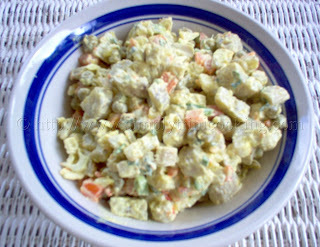 I love this dish, reminds me of St. Lucia. You’re welcome Jeanelle. Do come again. Haha! 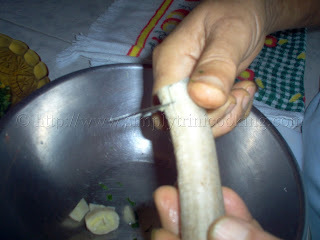 Why am I in Trinidad and looking up this recipe on the internet? Shame! Anyway thanks a lot I will probably be returning to this site time and time again! You’re welcome and do come again. If you want you could join my facebook group and get the latest recipes I post.